FOXBORO, Mass. – One player got a rare chance at redemption in a championship game. The other didn’t even expect to play a single snap. 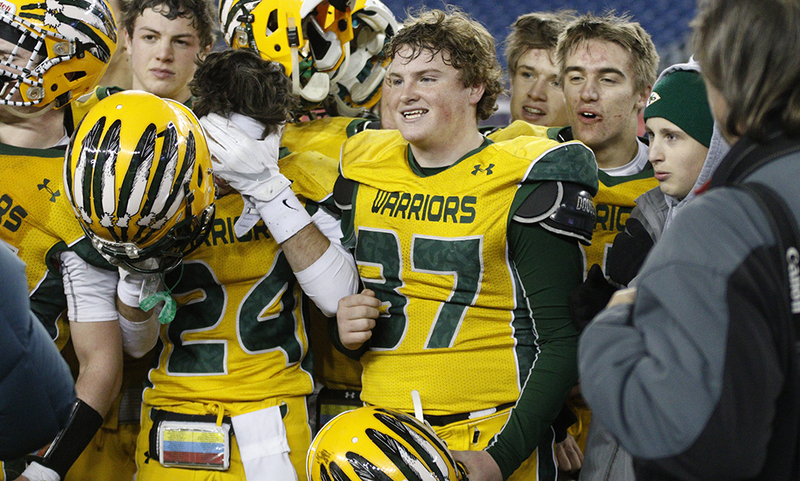 But in the end, King Philip sophomores Cole Baker and Robert Jarest will forever be remembered for helping the Warriors earn their 25th consecutive win, and more importantly a second straight MIAA State Championship. Baker isn’t a complete stranger to those who follow the Hockomock League. 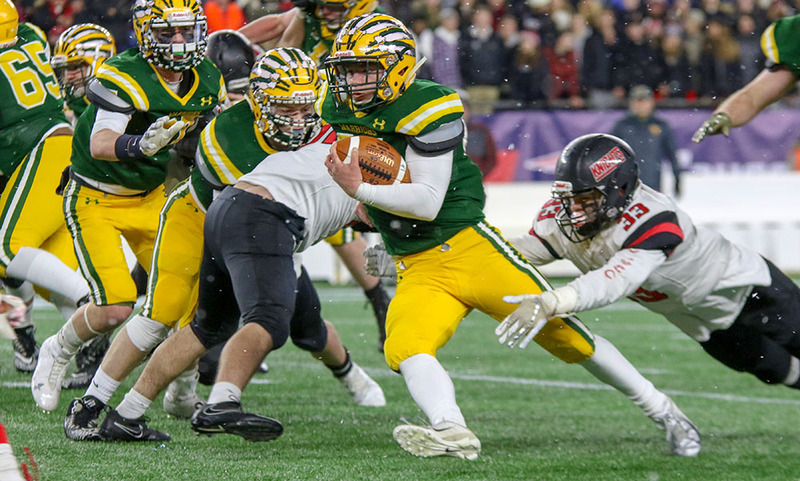 Despite playing football for the first time last year, he quickly earned the starting kicking job and successfully booted three point after attempts a year ago at Gillette Stadium in KP’s first state title win. Jarest, the team’s backup quarterback, is more known in the JV circles, though that certainly changed Friday night. 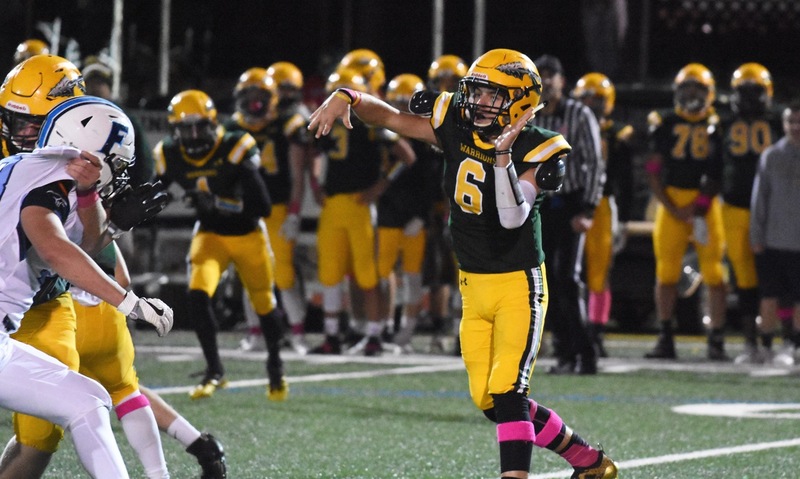 He played in two games this season, taking snaps in a blowout win over Oliver Ames, and then just over a week ago on Thanksgiving when the Warriors had the game in hand against Franklin. Before we get too far, it’s important to note that both had help in making their mark on the game. 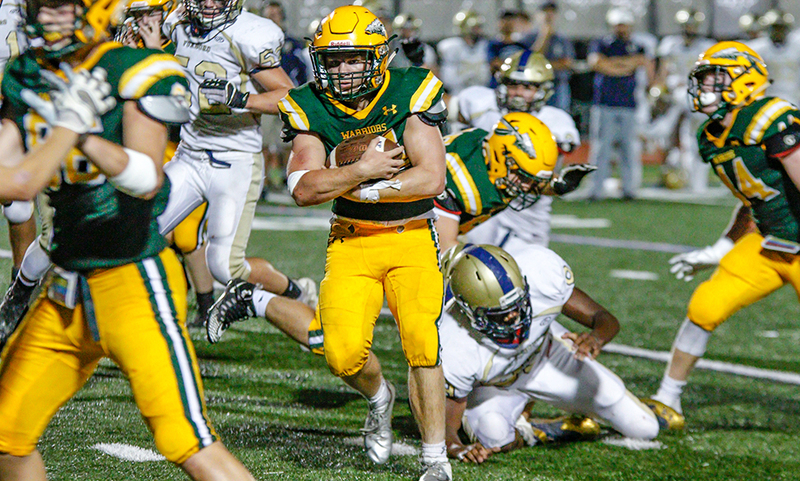 Senior running back and safety Shane Frommer was a force on both sides of the ball. He ran for over 100 yards, scored KP’s lone touchdown, and played lockdown defense – all through a hip pointer. 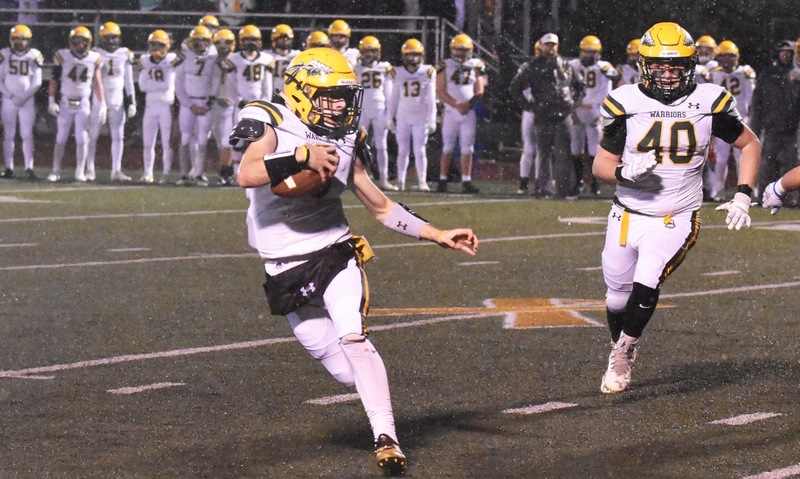 And KP’s offensive and defensive lines did their parts, while Andrew Dittrich anchored a secondary that limited L-S well below its average scoring total. 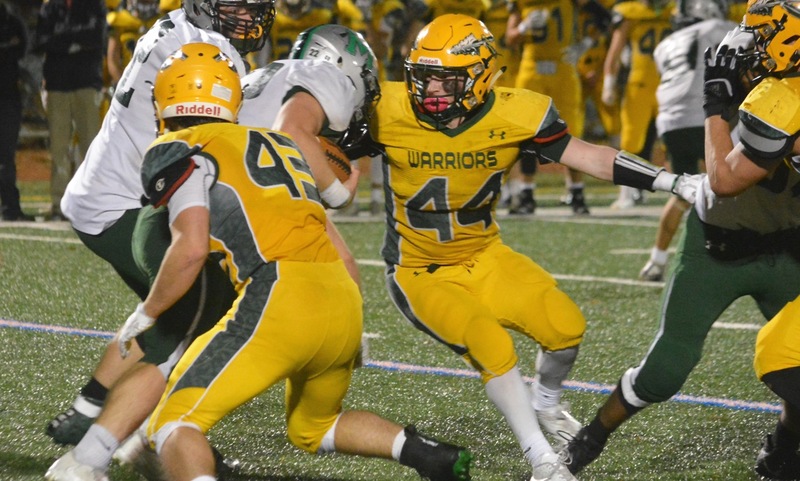 And of course Jack Webster’s strip sack highlighted the strong play of the linebackers. But there was just something special about the roles that Baker and Jarest played. Jarest had no intention of playing on Friday night. 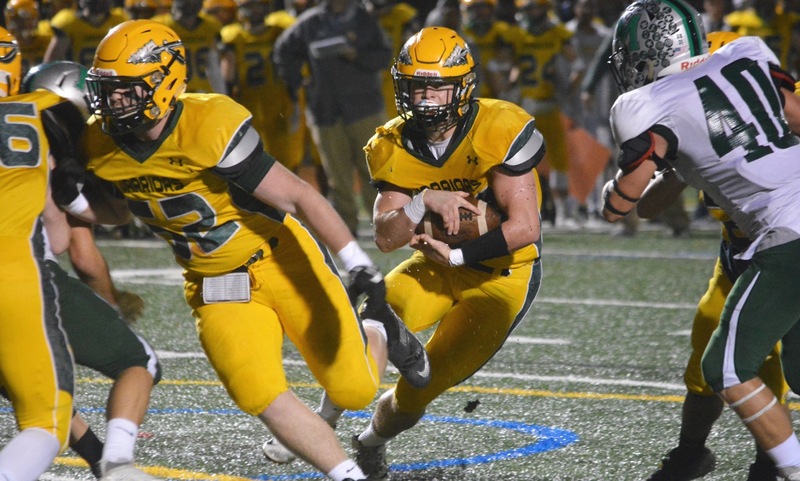 Senior quarterback Brendan Lydon, who never lost as a starter as a freshman, on the JV team, and the past two years on varsity, hasn’t missed any significant time in his career. But when Lydon scrambled for a key first down early in the second half and was hurt in the process, suddenly Jarest was thrust in the spotlight. 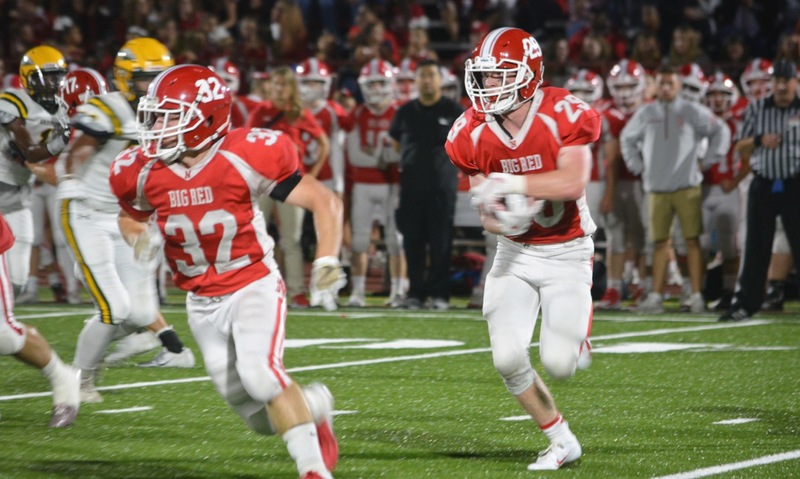 “[Lydon] is a tough kid, I didn’t expect him to get hurt, but he went down, and I just tried to do what the coaches asked me to do,” Jarest said. The nerves showed on the first snap under center, as he bobbled the ball and briefly lost it, but the Warriors recovered. His second snap, and all of the ones following that, came naturally. He handed the ball off to Shane Frommer plenty of times the rest of the way, but just two plays into his Super Bowl debut, he was faced with third and long. 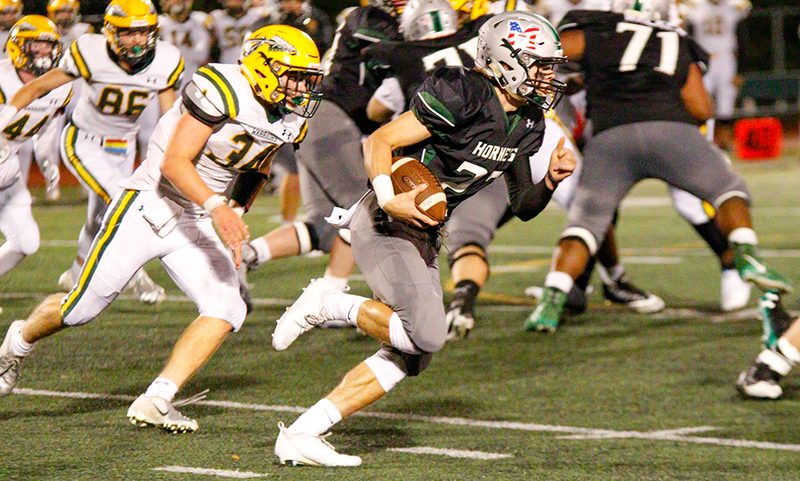 The nerves were quickly gone as Jarest took the snap, dropped back and heaved a perfectly weighted ball down the left sideline, connecting with senior Thomas Madden for 37-yards and a first down. And more importantly, the play gave life to a KP offense that had been limited to just 52 yards in the first half. “Once I saw him get open, I just threw it up there and he went and got it, he made a great catch,” Jarest said. Though Jarest didn’t have to throw the rest of the game, he handled his job like a seasoned vet. No more fumbled snaps, no plays gone wrong, no delay of games, and most importantly, no turnovers. After KP’s defense continued its strong second half play, KP’s offense marched into L-S territory throughout the end of the third quarter and first four minutes of the final frame. With Frommer leading the way, KP almost reached the red zone before running into a fourth down. That’s where Cole Baker enters. Baker was one of the top kickers again this year, with a high success rate on extra points, and even kicked a game-winning field goal earlier this season against Franklin. So it wasn’t a huge surprise when KP head coach Brian Lee sent him out for a 39-yard attempt, in a tie game, just before the midway point of the final quarter. Unfortunately, the kick sailed just wide to the left. If the game had been played at Macktaz Field, or any Hockomock venue, or any high school football field, it likely would have been good. 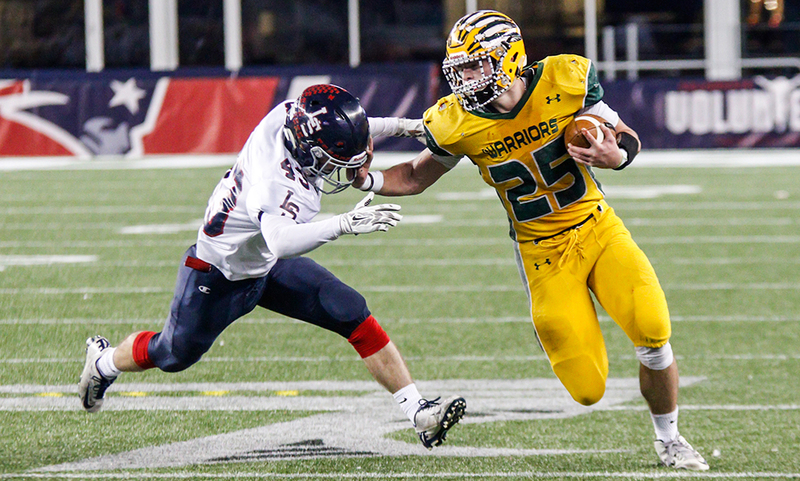 But at Gillette Stadium, the state finals are played with NFL hash marks and much more narrow field goal posts. “It bothers me some when I miss but you just have to let it go and come back and be ready for the next one,” Baker said. Little did Baker know, his next chance would come just minutes later. Webster came flying in from the blind side and came up with the strip sack, with Evan Rice falling on the loose ball. A heavy dose of Frommer got the Warriors closer, but on fourth and eight, Lee didn’t think too long about what he wanted to do. Baker split the uprights perfectly with plenty of distance on his 31-yard field goal attempt with just 1:36 to play. “It was awesome, I knew as soon as I hit the ball it was good. I just turned to my teammates and I was just screaming,” Baker said.